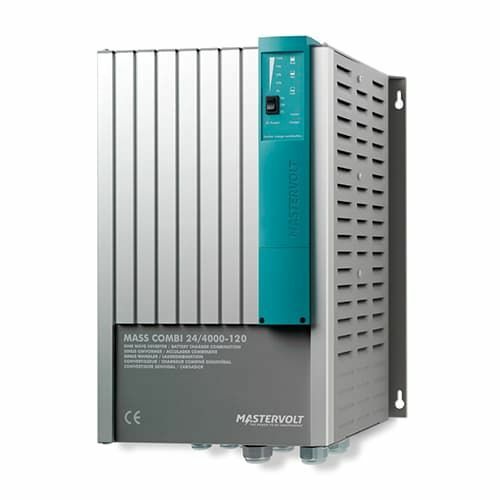 The Mastervolt Combi literally combines an advanced battery charger and silent-running inverter in one remarkably compact device. But that isnt all: it also adds extra functionality. This includes Power Assist, system paralleling and secondary battery charging. This makes the Combi your ideal solution for a wide range of needs, from low power recreational use right up to full-on, high power industrial applications. Every model of the Mastervolt Combi is highly versatile, so using one greatly simplifies installation. This single product not only brings you fast and complete charging of your starter and service batteries, it also provides a silent, robust and clean AC power supply. Multiple AC outputs allow heavy-draw items to be separated from the most critical equipment, making sure they dont unintentionally deplete your batteries. The AC inputs facilitate both mains and generator connections, which the Combi can support with additional power if your loads require more than either can provide. Essentially, just this one product can handle all the power requirements in an autonomous system. The unique design of the Combi range is typically Mastervolt. Rather than installing heavy transformers, you can use our high-frequency technology for major benefits in terms of compact size, a lightweight chassis and silent running (there is no transformer hum). Higher yields possible via parallel switching (only 2500 W models).